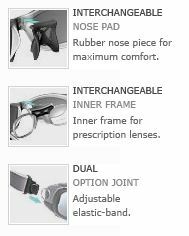 Nannini’s Modular 1 Sports Glasses combine form and function for a stylish way to protect your eyes! Choice of polycarbonate lenses that are made for mountain conditions. Modular 1 can be fully dismantled and reconstructed from the parts list. A variety of lens tints are available; every individual gets their own view of the mountain while sporting these trendy frames.